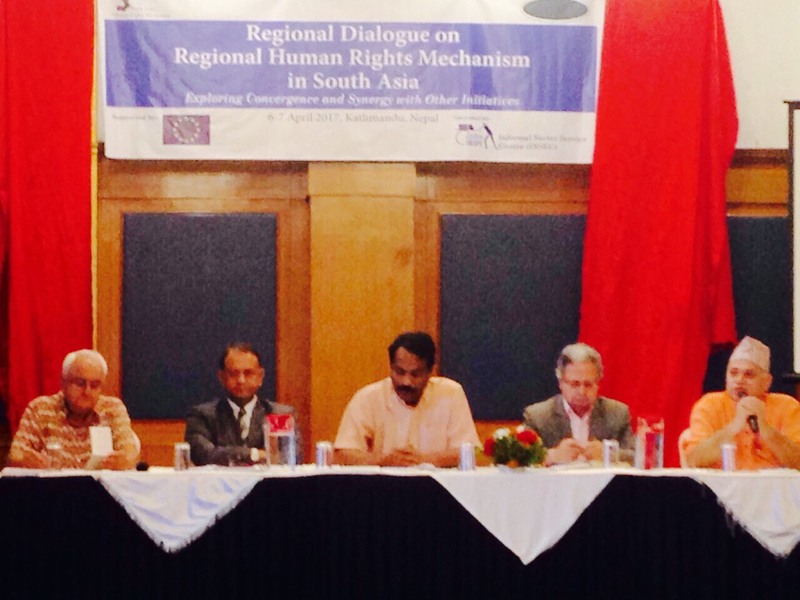 The regional dialogue on “Regional Human Rights Mechanism in South Asia” has been held in Kathmandu from April 6 to 7. The program was organized by the Asian Forum for Human Rights and Development (FORUM-ASIA) with the participation by its South Asian members and other key civil society expert to discuss the importance of a regional human rights mechanism for south asia. The regional dialogue had critically reviewed and reflected the on-going efforts towards the establishment of a regional human rights mechanism in south asia. The Regional Initiative for a South Asian Human Rights Mechanism (RISAHRM) was initially established in Dehli in 2012 with the aim of launching and coordinating advocacy along with awareness campaign towards the establishment of regional human rights mechanism in this region. Speaking at the program, FORUM-ASIA Executive Director John Samuel stressed that an effective regional human rights mechanism is essential to ensure human rights in this region. While releasing a press statement on April 8, FORUM-ASIA stressed the importance of regional human rights mechanism in south asia to ensure all human rights for all in the region.